Day 14. I’m not exactly sure how it’s already two weeks into the New Year. Being busy definitely aids time to fly. I have a feeling I’m going to blink and find myself typing “365” after the word “day” any minute now. 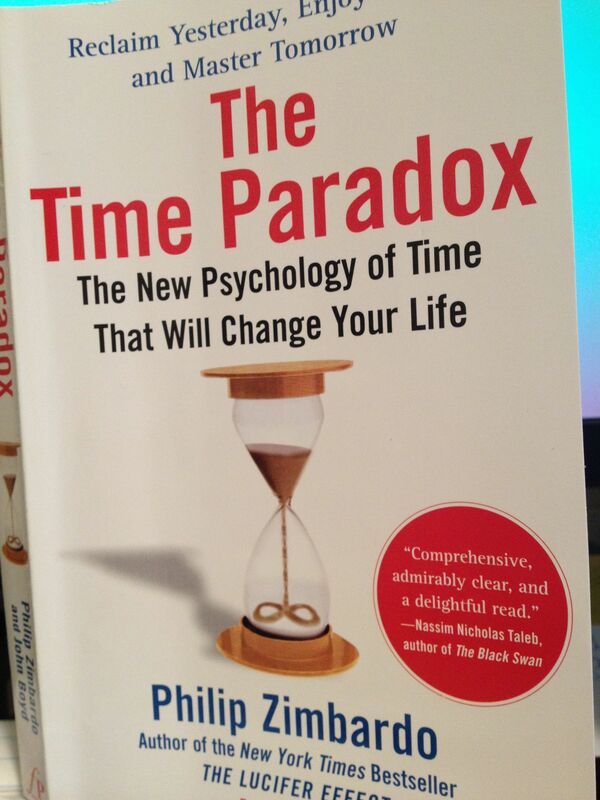 In sharp contrast, I’ve been slogging my way through the book “The Time Paradox” for the last three months and I can’t seem to get to the end. The book was written by two Ph.D. smarty-pants types, Philip Zimbardo and John Boyd and it is all about, well, the paradox of time. I hate jigsaw puzzles but I dig paradoxes—the more absurd and contradictory the better. A time or two (or twenty) I have been labeled a walking contradiction by my main squeeze. It’s a mystery to me why I’ve been unable to sink my teeth into or wrap my mind around this book, which seems so up my alley. I will say it’s really heady, very cerebral. That’s a bit of a no-brainer considering the main author is a professor emeritus at Stanford and the former president of the American Psychological Association. They had me at “hello” with a section on why the book was worth my time because of the universal fear of death and how “denial of death is a denial that time will end.” “This book is about living life fully, about squeezing life from every year, month, hour, minute, and second that you are allotted.” Awesome. I was in then I promptly fell asleep. At this point, I am officially abandoning the book. I just don’t have the time. Perhaps I’ll be ready for it at some other point in time but the time is not now. Back on the crowded bookshelf it goes. In order for me to actually do what they’re saying their book is about, living life fully, which coincides with the whole point of my experiment, I have to focus on simply being in the moment of time I’m in not thinking about it or analyzing it or worrying about what time it is because if I do that then I’m not really experiencing my time or, more importantly, I’m not getting anything done during my time. 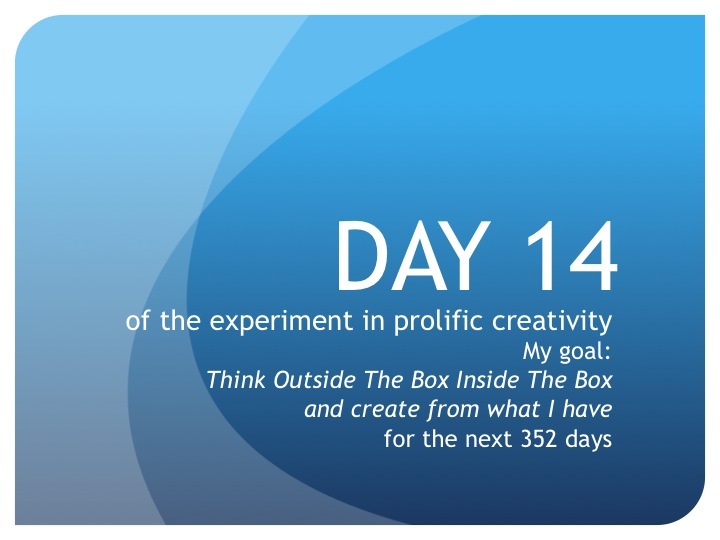 Think Outside The Box Inside The Box may be a paradox but my personal definition of it is as a verb, “to get creative with what you have in order to create from what you have,” in other words, it’s all about doing, taking action and seeing results. I can’t create from what I have if all I do is read about the “six most common time perspectives in the western world” to figure out which time perspective or combination of time perspectives I actually have! Whether I’m specifically a past-positive, past-negative, present-hedonistic, present-fatalistic, future, or transcendental-future time perspective just doesn’t matter to me right now. I’m the time perspective that recognizes life is precious. We don’t have all the time in the world and we have to make the most out of it however much we have left. I’m that time perspective. What matters to me is thinking outside the box inside the box and creating from what I have not what time it is. Until tomorrow, create from what you have…and don’t worry about what time it is.